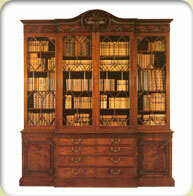 Since 1976, Jere's Antiques has been a major source of supplies for antique auction houses, designers and individuals. Owner Jere Myers maintains his own warehouse in England and has buyers and pickers working throughout Britain and on the continent in Belgium, Holland and France. You will find an amazing selection of 18th, 19th and 20th century furniture of all types of styles, woods and price range. Whether you seek a bar for home or commercial use, or furniture in mahogany, walnut, oak or pine, Jere has it all. You will find an 18th century chest, the finest 19th century breakfront, an art deco vanity and chairs in sets of four, six, eight, 10, 12 and often sets of 14 and larger. Our UK suppliers also specialise in the making of exquisite pieces of bespoke furniture. Made by craftsman with extreme emphasis on quality and perfection. We hold stock of pieces in a variety of colours but can order to your style and requirements. The furniture features mirrors which are vauxhall bevelled and distressed. Both "Gold Leaf" and "Dutch Metal" are used in abundance by our UK suppliers to make each piece a very original piece of furniture. The variety is fabulous. Allow yourself some time to visit Jere's. Revel in the fine craftsmanship from the past and unearth something special for yourself at Jere's Antiques.